Hypnosis can help you to quit for good. We all know that smoking damages good health but we have an amazing capacity to bury our heads in the sand and ignore what we don’t want to hear. The reason that it is difficult to quit smoking without help is that we become physically and psychologically dependent on this habit. It is the psychological dependency that provides people with more difficulties in stopping smoking than the physical withdrawal from nicotine. Do you really want to continue to smoke? As soon as you know that you want to stop and start to feel better, give me a call. Hypnotherapy will provide you with all the necessary resources to stop smoking and hypnosis can make the process of quitting smoking easy!! The benefits of stopping smoking are felt straight away as your levels of toxic carbon monoxide fall very quickly. The levels of carbon monoxide in your body will be the same as a non-smoker after only 24 hours of not smoking. Your circulation will also begin to return to normal. My Stopping Smoking Programme is a highly effective combination of Hypnosis, Neuro-linguistic programming and CBT which involves both the conscious and the un-conscious levels of mind activity. 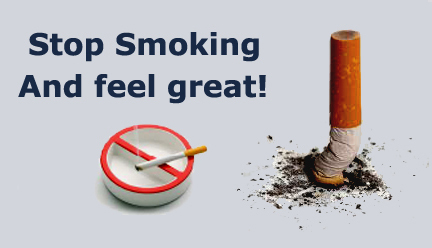 So when you are ready to give up your habit of smoking, phone me to book your appointment. It would be helpful for you to have your diary to hand so that we can avoid any dates that might be stressful for you. I will e.mail/post you a smoking questionnaire which you will need to complete and send to me before Session One of your Stopping Smoking session. Step 1: Contact me to let me know that you want to stop smoking and book your appointment. Step 2: Complete the stopping smoking questionnaire that I will e.mail/post you and send it back to me. Step 4: Enjoy not smoking for a week or continue to smoke but become more aware of your decision not to breathe damaging smoke into your lungs. Step 6: Make your commitment to becoming a non smoking person and take control of your health , save yourself money and feel much better about yourself and your future. Step 7: Feel liberated from your deeply destructive habit, proud of your great achievement and optimistic about further beneficial changes. After three to nine months coughs, wheezing eases and your breathing improves.